This is, as far as is known, a full list of post-1973 codes used to identify train maintenance depots. 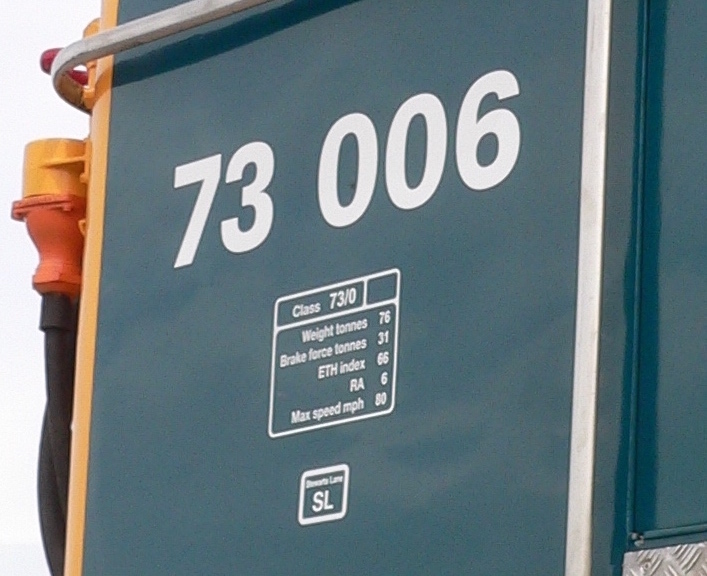 Depot codes were applied as stickers to rolling stock, usually (but not always) underneath the data panel; an example on a class 73 is shown below; the observant will note that these form the inspiration for this site's logo. Some codes changed over the years and some codes were reused, so some depots and codes are listed more than once. Where known, when each code was used is shown, together with whether a depot is still in use (with operator) or has closed. For NLC, TIPLOC and Stanox codes for depots, the reader is referred to this page. CRS codes, where allocated, are shown here. Codes shown in bold red type are believed to be correct, but require confirmation from a separate source to verify. AP Ashford Rail Plant Balfour Beatty Should be AZ? BF Bedford Cauldwell Govia Thameslink Railway (Thameslink) (formerly Southern for First Capital Connect) Class 319s carried BF1 stickers: the "1" may be for "First"
LD Leeds Midland Road Freightliner Same as Balm Road? LL Liverpool (Downhills) XDG Alstom Depot also referred to as "Edge Hill" or "Alstom Liverpool Traincare Centre"
LV London Liverpool Street Greater Anglia? MK Markinch MNC J Cameron Closed? MV Manchester Victoria XVS unknown Unofficial code? SR Stratford Major Depot/Level 5 Closed 31 March 1991. Also known as "High Meads", "Stratford New Works", and "Stratford Traction Repair Shops"